Peter Perez is the Deputy Assistant Secretary for Manufacturing within the International Trade Administration’s Manufacturing and Services division. When we think of manufacturing, we often think of what we make in factories as the end product. But when it comes to manufacturing farming equipment, the tractor is just the start – the harvest is the end product. This week I got to see firsthand how U.S. farming equipment is being put to work while taking part in the World Ag Expo in Tulare, California. Located in California’s Central Valley, the event hosts U.S. manufacturers and attracts foreign buyers from more than 70 different countries. While there, I had the pleasure of touring the agriculture showcase with delegates from Mexico, Bulgaria, and Romania, and enjoyed introducing them to U.S. suppliers and spurring new trade partnerships. It is clear that U.S. farmers aren’t the only ones clamoring to use American manufactured farming equipment to improve harvests, efficiency and quality; U.S. farm equipment sets the international standard, and is an important part of our nation’s export portfolio. 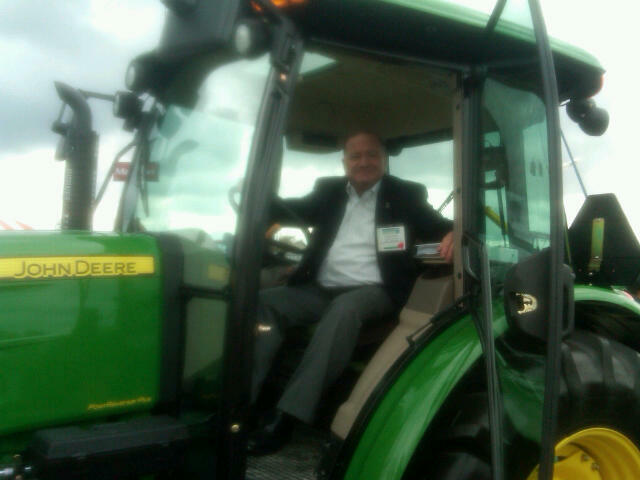 Peter Perez testing out a John Deere tractor. Built in Moline, IL, this $250,000 piece of equipment represents some of the most technologically advanced American manufactured machines in the industry. Expanding manufacturing exports is crucial to the continued success of the burgeoning manufacturing industry. Through the use of foreign markets, U.S. businesses have increased their customer bases, boosting production and their ability to support new jobs at home. In January alone, the U.S. manufacturing sector added 50,000 jobs, which means in the last two years the industry added a resounding 404,000 jobs in the U.S. And many of these manufacturing jobs are supported by profits made through international trade. The momentum we are seeing in U.S. manufacturing was also the topic of a White House Business Council roundtable I convened in conjunction with the Expo, where we brought together leading agriculture stakeholders to discuss ways to further support U.S. exports. It was a great opportunity to hear directly about the ways in which U.S. suppliers are investing in research and development, and creating new products to make individual farmers all around the world more productive. Innovation is the hallmark of the U.S. manufacturing sector, and the key to its comeback. I can tell you with confidence that after seeing the products displayed at the Expo, advanced manufacturing will continue to be a driver for the U.S. economy in the months and years to come. In his recent State of the Union address, President Obama reiterated his commitment to rebuilding our manufacturing sector as we ensure our country is built to last. This Administration is committed to supporting U.S. manufacturers all across the country, and to help realize the fruits of their labor.